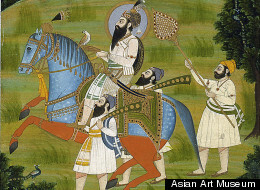 While Sikh art largely celebrates the unique spiritual and secular identity of the Sikh people, it also reflects the artistic diversity of the Punjab region (an area now divided between India and Pakistan) where Sikhism originated. From social customs to costumes, to the painting styles of the Mughal dynasty and other kingdoms in the region, Sikh artists synthesized a wide range of elements to create their own distinct imagery. Guru Nanak and his companions Mardana and Bhai Bala. The followers of Sikh religion are disciples of 10 esteemed gurus, or teachers, the first of whom was Nanak (1469–1539), Sikhism’s historical founder. Although Hindu by birth, Nanak’s teachings are centered on the concept of one sovereign god and Sikh beliefs embrace aspects of other religious traditions, including Islam. Nanak has said, “There is no Hindu, there is no Muslim.” His life and teachings are compiled into texts known as janam sakhis (life stories)n The paintings in illustrated versions of this text bring to life the guru not only as an older spiritual leader, but also as a young man. The outward emblems of Sikhism, such as uncut hair and turbans, were not formally adopted until 1699, when Gobind Singh (1666–1708), the 10th guru, established the Khalsa (Order of the Pure) in order to provide persecuted Sikhs with a cohesive identity. The spiritual lineage that began with Nanak ended when Gobind Singh named as his successor the Adi Granth (Primal Book), Sikhism’s sacred text. The Adi Granth, considered the eternal guru, is the devotional focus of all Sikh temples. 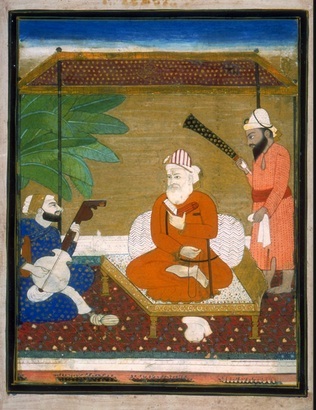 Under the patronage of Sikh rulers, art production reflected the splendor of the royal courts. 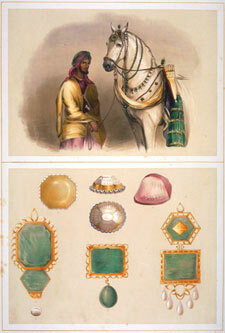 The Sikh clans ruled a number of small kingdoms in the Punjab area. By 1800 these kingdoms were unified by the general Ranjit Singh, the “Lion of the Punjab.” He was crowned “maharaja” (literally, “great king”) in 1801 and built a stable north Indian kingdom centered on the city of Lahore. A brilliant general and strategist, he successfully negotiated with surrounding powers -- the Afghans, the Marathas, and the Rajput chiefs of the hill states -- and managed to halt the advance of the British into the region. Ranjit Singh’s death in 1839 was followed by a bitter struggle for power, and later separated the Sikh kingdom into several smaller independent kingdoms in the Punjab region -- such as Patiala, Kapurthala, Nabha, Jammu and Kashmir. Sikh royalty commissioned paintings, jewelry and architectural structures that reflected their positions as cultured patrons and also celebrated their identity. Finely made objects were produced for and used in a devotional context; they were also used in other aspects of courtly and everyday life. The splendor of the Sikh kingdoms also impressed European artists, some of whom attempted to capture something of the unique character of Sikh culture and the Punjab in their works. These artworks tell a compelling story of the Sikh people and the forging of a culture rooted in the teachings of Nanak and the "ethical conduct and equality of all people." All images courtesy of the Asian Art Museum of San Francisco.